Visualization of a scene, ahead of time, is often the key to creating something special. 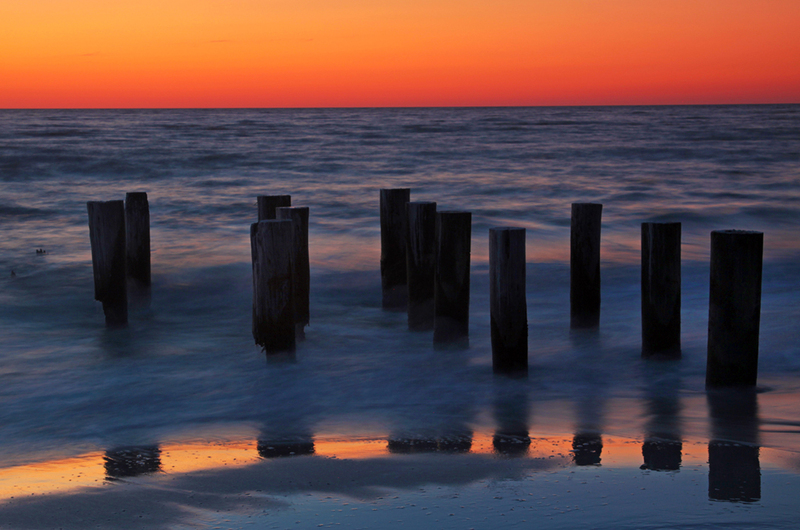 In the image above, before the sun was going to set, I positioned a tripod in such a way as to best capture the pilings in the scene, once the sun had gone down. This included monitoring the spacing and assuring their line-up created a pleasant composition throughout the frame. At this particular location, I also noticed that sometimes, if the water receded far enough back into the Gulf of Mexico, there was a reflection of the pilings on the beach. From experience, some sunsets are dull, while others are spectacular and most others are somewhere in between. As I have said before, the best part of the sunset, is after it has gone below the horizon, watching for the afterglow. On this particular evening, for a very short time, there was a beautiful, solid, orange background on the horizon. I took advantage of that, and the timing of the tide, to capture the reflection of the pilings on the beach. This scenario was quite short lived giving me only a couple of long exposures to get it right. This was an example of being in the right place at the right time…and waiting for the right moment.